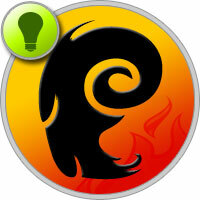 Aries is a sign of the fire element, indicates strength, energy, organizational abilities. People of this sign are striving for independent activity, usually they are talented leaders, successful businessmen. But the professional destiny of Aries depends not only on natural data, but also on their spiritual, intellectual level. Therefore, the horoscope for Aries contains general recommendations that allow you to determine the most appropriate areas of activity, to warn against possible mistakes. Hard-working people of the Aries sign are fully dedicated to work. They are considered highly qualified specialists in their field, possess the qualities that allow taking place in the profession: courage, perseverance, purposefulness. Easily embody the conceived, with enthusiasm and zeal begin a new business, just finishing the previous one. But the excessive self-confidence of Aries, disparaging attitude to the opinion of colleagues negatively affect the work process, sometimes hinder a successful career. Aries-chief — demanding, strict, but fair leader. Loves to rule, above all puts professionalism, dedication to business. He expects from his subordinates faithful performance of duties, suppresses any attempts to question his authority of the head. Excessively strict with lazy, irresponsible workers. Some employees consider him a despot and a tyrant. Despite outbursts of anger, Aries-chief never acts at the expense of the common cause, agrees with the opinion of professionals, moreover encourages diligent and hard-working employees. Aries-subordinate requires special treatment, or rather, he deserves it. Has a high professionalism, very responsibly applies to his duties. But he needs to see the ultimate goal of the work and feel his own worth. Aries subordinate will not tolerate boorish behavior of the head even for the sake of high wages, money for him is not an end in itself. Especially if the decisions and actions of the leader can be questioned because of his incompetence. It is hard for Aries to follow a clear schedule of work, he is categorically not suited to monotonous activity, for example, conveyor production. Shows good results if you have complete freedom of action. Life success of Aries brings their courage, determination, enterprise. Do not fall for difficulties, make independent decisions. They are subject to any kind of activity, their managerial abilities can be applied in many spheres of life. Aries do not tolerate boredom and monotony, internal anxiety forces them to avoid clear commitments and monotonous work. It is much better for them to communicate with people, make risky transactions, solve financial problems. Aries men have a talent for inventive activity, they are well versed in engineering, electronics. They fit the profession: a designer, a technician, a civil engineer. Aries — the defenders of justice and order, are not afraid to risk, demonstrate courage, courage. Often they become military, police, and special services. But it is better to refrain from political and legal activities, they can fail because of the inability to think strategically, scrupulously calculate the actions of opponents. But they have an entrepreneurial vein, conclude profitable transactions, rarely experience financial difficulties. Aries women are business, independent people, confident in themselves among men. Therefore, men’s professions are often chosen, many of them have the reputation of demanding managers. Pretty successful in doing their own business, but only if the case brings pleasure. These women can be assigned work of any complexity and importance, for example, in medicine it: a surgeon, a psychotherapist, department head or laboratory. In the world of art and art position themselves as adherents of the classical style: a writer, artist, singer, actress. Ambitious, confident people-Aries are able to make independent decisions, do not fall for difficulties. They aspire to occupy leading posts, they do not know how and do not want to obey. The natural pull to power makes them all the time move forward, to the heights of a career. An obstacle on the way to a high position can serve as the impatience of Aries, the reluctance to delve into the subtleties of the matter. It is necessary to have reliable partners or subordinates capable of taking on routine duties. In the rest, Aries easily achieve what they have conceived, they are real enthusiasts, fans of their business. The main motive is the realization of their plans and ideas, but not the desire to achieve material prosperity. Equally important is the public recognition of their merits. Aries perceive business as a way of self-realization, they are motivated by the desire to prove their own superiority, to confirm their leadership ambitions. They do not tolerate rivalry, so partners must strictly follow their instructions. They conduct business quite successfully, offer innovative ideas, first introduce new technologies, courageously make important decisions. But sometimes they do not have enough patience to think carefully about the concept of business promotion. The propensity to spend money, the frivolous attitude to money is another important point to pay attention to. Success is achieved in alliance with partners who are able to assume routine duties. Preferred business areas: production, sale of goods for tourism and outdoor activities, marketing, advertising, architecture, entertainment industry. Aries treat money fairly calmly, it is only a means of achieving the goal, but not the goal itself. Enterprising people rarely experience financial difficulties, they earn well enough, but are prone to frivolous spending. Do not have a passion for accumulation, without undue doubt, invest large amounts in their projects or buy very expensive things. Need control of the other half or business partner, do not charge Aries solely to manage the budget of the family or company. Men-Aries generously spend money not only on their beloved woman, but also on business partners. For them, in the order of things, give an expensive car or a luxurious decoration. For ambitious people of this sign, money is evidence of success, confirmation of high professionalism. Aries confident in their abilities believe that the lack of money is an occasion to work with redoubled force in order to achieve an even higher position, and thus improve their material condition. But all the same they should not go to entertainments less and avoid participation in gambling. Aries women successfully solve the most difficult business issues, so they easily manage money. It is believed that financial management does not require special efforts. Stubborn, resolute people do not listen to the opinion of either close or strange people, generously spend money on luxury things for themselves, expensive gifts for relatives and friends. Their business qualities are not in doubt, so even with huge spending Aries is always well enough financially secured. But women of this sign should not borrow money and be addicted to shopping. Aries — a fire sign, quick-tempered and stubborn character of its representatives makes itself felt in any circumstances, not an exception and business relations. Fruitful cooperation is possible with reserved, responsible people, devoid of leadership ambitions. For example, the alliance of the dynamic Aries and energetic Sagittarius will be quite successful. Like a partnership with Aquarius, Taurus and Libra. A completely successful future awaits the union of Aries and Leo, if two charismatic leaders can make friends. Creatively gifted representative of the sign of Pisces is ready to completely submit to the willed Aries, the union is waiting for a successful future. Aries should not conduct common affairs with partners who have a quick-tempered, stubborn character. For example, a rather complicated relationship will be with Scorpio, two strong signs interfere with the arcs of a friend. Quiet, pedantic Capricorn is too much into details, stubbornly defends his point of view, which causes irritation in Aries. Gemini has a rich imagination, his ideas can bring business to a new level, but does not seek cooperation, Aries will be hard to bear his quirks. Aries and Aries can be quite successful if the partners learn to yield to each other, which will require significant efforts on both sides.